Few things are more ubiquitous at any good happy hour than a prawn cocktail. 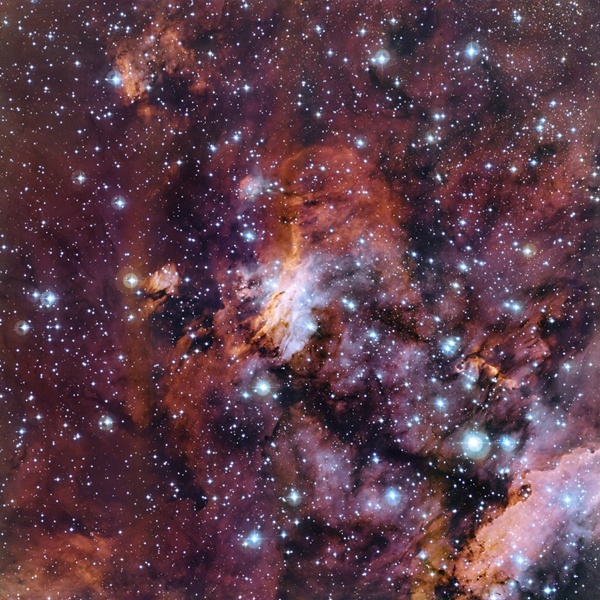 So we are pleased to share one of our favorite nebulas located 6,000 light years from earth in the Scorpio constellation that goes by the same name, the Prawn Nebula (aka IC 4628 and Gum 56, named after Colin Stanley Gum). Whereas the prawn cocktail is simple recipe of shrimp and Mary Rose sauce, the Prawn Nebula has many more cosmic ingredients to spice things up. In fact, the mixture of elemental dust and gas clouds from collapsed stars makes the Prawn Nebula quite the active nursery for baby stars. A new image of the nebula published by the ESO's Gems program in September 2015 used the MPG/ESO 2.2-m telescope at the La Silla Observatory in Chile’s Atacama Desert to create stunning detail of nebula and its ability to recycle the materials from old stars to create new ones.